If your iCloud Drive is active you can gain access to your cloud gallery and browse it on the iPad Air 2 without the need of storing it locally. If you have opted to store everything in your iCloud Drive, you can save precious space and still have access to your images and videos. You'll need a working internet connection, of course, and the iCloud Drive free quota is only 5GB. 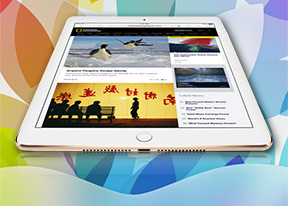 Viewing images on the Apple iPad Air 2 is a pleasure thanks to its superb display. The music player hasn't changed its white, flat looks but has gained new functionality. You can create playlists, delete songs right from within the player and reorder tabs whichever way you like. Album view is available too - you access it by flipping the device landscape. It lists all the covers to the albums you have in your library. Tapping on an album thumb lists all the tracks in it. The videos app allows you to upload only supported formats via iTunes or purchase videos from the iTunes store. This is an extremely disappointing showing by a platform that is supposed to excel at multimedia consumption. The lack of extra functionality is bad enough, but having to use just an extremely limited number of media formats or resorting to converting files, which is both slow and inconvenient is a real deal-breaker. The iPad Air 2 has as great audio quality as we've come to expect from Apple's slates. Very loud and nicely clear it can please even the most demanding of users. When used with an active external amplifier the iPad Air 2 has no weak spots to its performance - it posts excellent scores top to bottom and garnishes them with loudness way beyond the reach of most of its competitors. The solitary exception being the HTC Nexus 9, of course, which is arguably the only tablet to beat the latest Apple slate in the audio game. 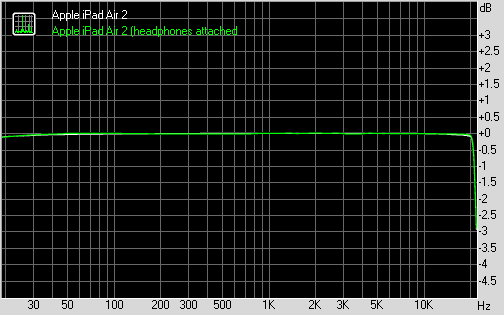 Plug in a pair of headphones and you get a minor spike in stereo crosstalk, but no other degradation whatsoever. A solid effort indeed.